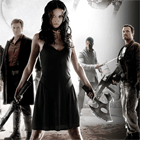 Terminator, sci-fi/western warrior, DC Comics super villain and DC Comics super HERO – they’re all…Summer Glau! I sit down to chat with the Firefly/Arrow actress on the latest episode! Do you like year end “Best of” shows? Good, cause here’s another one. This episode, we pick the 21 geekiest things of 2012… excluding the Avengers movie. Sorta. What’s on your 2012 list? Head over to our podcast Facebook page and let us know. Don’t forget, head over to SuperHeroStuff.com and use our podcast code “SPM12” to save 12% on your order. Get yourself something pretty. The third round of the Fast Five. In which Art and Freddie are praise random appearances of David Lynch and question comic creator allegiance. The Backroom Comics crew review the new film Scott Pilgrim vs. The World (spoiler free), give some recommendation on new comic series to check out, and take a look through the August 2010 comics preview guide. We review Joss Whedon’s Serenity. Music by Legbone and Black Wolf Fight. This episode is our last international one as Scott is soon set to return to England. In the second of our new format episodes we have two segments to this show, What If…where we have a lengthy discussion about the repercussions of a TV show not being cancelled. This is in terms of the show itself and the wider scope of TV in general and this episode we talk about Firefly. Our second segment is the familiar Hidden Gem where we talk about the classic 1981 film Excalibur. As ever if you want to get in touch about anything we’ve talked about in this episode you can email us individually at steve@comicbookoutsiders.com or scott@comicbookoutsiders.com. You could also let us know what you think with a review at our myspace, facebook, and libsyn pages, or leave us an iTunes review. Or just let us know in this very thread!